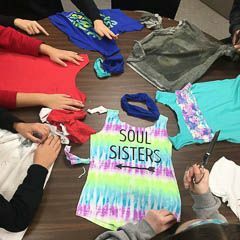 In early March, 6th grade students visited the Second Harvest Food Bank’s facility in San Carlos where they made reusable tote bags from t-shirts. They were also given a tour of the facility and learned more about hunger in our community. The visit was part of Crystal’s Human Development programming. 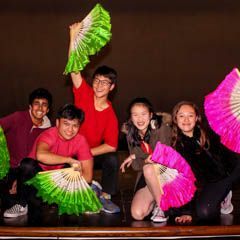 The annual Lunar New Year Banquet brought our Crystal community together on the Upper School campus as we celebrated the Year of the Pig. Delicious food and dazzling student performances were the main attraction. The evening was a celebration of the rich cultural identities found in our community and a reminder of how lucky we are to have these varied perspectives. Crystal Springs Uplands School is committed to being a diverse and inclusive community. Such a community values and celebrates individual differences and ensures that each individual's unique background and perspective can inform and enrich the educational experience for all. In seeking to create and sustain a community that reflects the diversity of the Bay Area, we provide a dynamic learning environment and strive to prepare students for the world in which they live. Our curriculum exposes students to myriad viewpoints and experiences that challenge and broaden their perspectives. 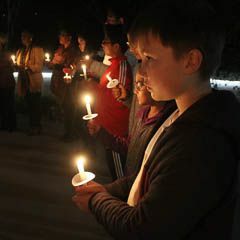 CSUS believes that students, parents/guardians, faculty, staff, administration and trustees with inclusive perspectives and attitudes make our school a place of respect and compassion in which all members belong and thrive. Non-discriminatory policy: Crystal Springs Uplands School admits students of any race, color, religion, sexual orientation, gender identity and expression, national and ethnic origin to all rights, privileges, programs, and activities generally accorded or made available to students at the school. It does not discriminate on the basis of race, color, religion, sexual orientation, gender identity and expression, national and ethnic origin in administration of its educational policies, admissions policies, financial aid programs, and athletic and other school-administered programs.